still have two weeks to submit your entry. I thought I would use my new Maja papers, Summer Crush, on this card and tried to echo the picture of the bicycle with this cute stamp of Tilda on her bike. daughter needing a dress altered, hubby needs some trousers turning up, odd things needing ironing etc..the usual! The only die I have used here is Joy Crafts butterfly border, which has been cut and glittered, with a large fancy doily in the background and a smaller one behind the image. 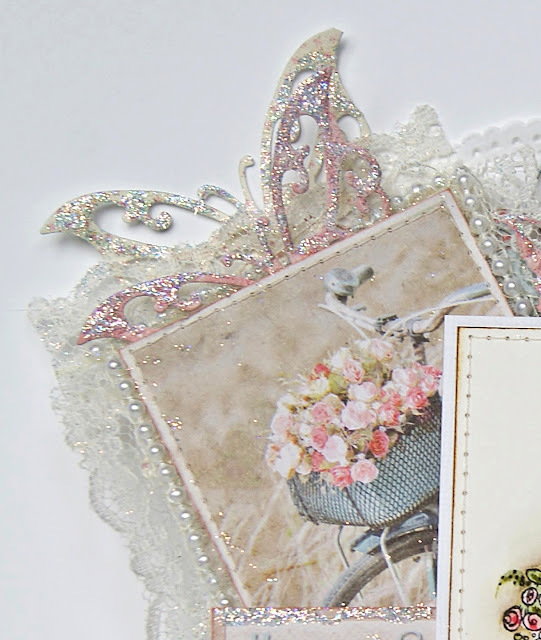 All the embellishments are available over at Live and Love crafts, including the luscious lace and flowers. Enjoy your week and I hope the sun shines for you all. I have been making Christmas Cards. 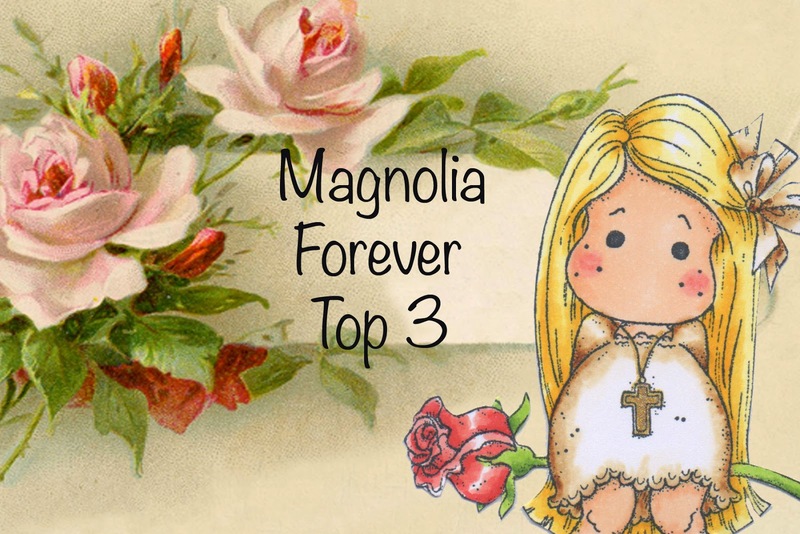 I love making them and never get bored...I could make them for ever I think! Maja. This collection is called Vintage Frost. The stamp is little "Joyful Tilda" from the 2013 Winter Wonderland collection and I have painted her with distress re-inkers, adding Glamour Dust on her hat and lace. The Joined Christmas trees and Snowflakes were cut with Doo-hickey Dies, then glittered with Glamour Dust. 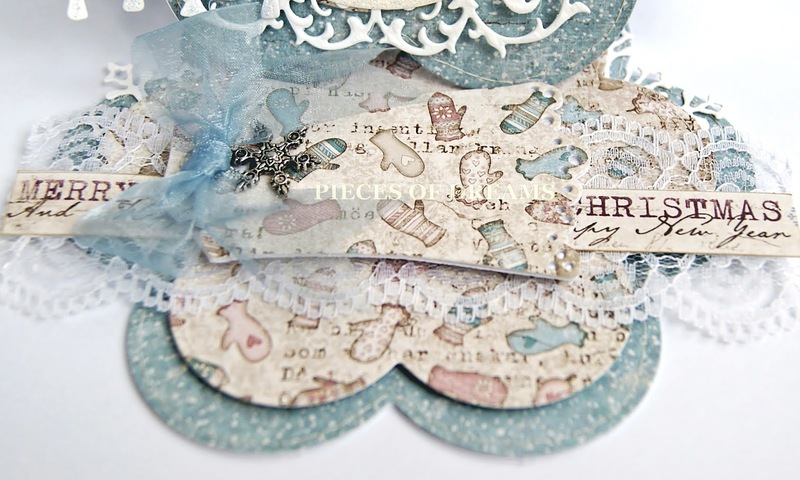 The tag on the bottom layer opens for a sentiment and is decorated with a bow and a snow flake charm. The Fancy Oval behind Tilda is a Joy Craft Die. 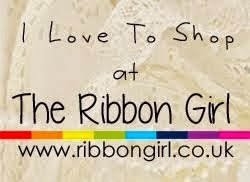 The ribbon, lace and diamanté snow flake are from The Ribbon Girl. 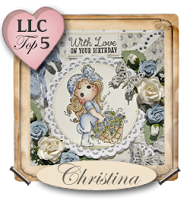 The Maja paper, flowers and charm are all from Live and Love Crafts. Thank you for choosing to browse my blog today. We are having the most beautiful Summer weekend here in London, it's just perfect! Everything's ready for a barbeque in the garden, including the Pimms! So as I am feeling happy, let's have a cheery challenge. The DT girls have made some wonderful cards to inspire you and here is mine, It's a criss-cross card. I haven't made one of these for ages, but the Pion papers inspired me this time. This is Tilda with Rose Basket. She has been painted with distress re- inkers. I wish you could see the glamour dust on her hat and roses, but the camera didn't pick it out. 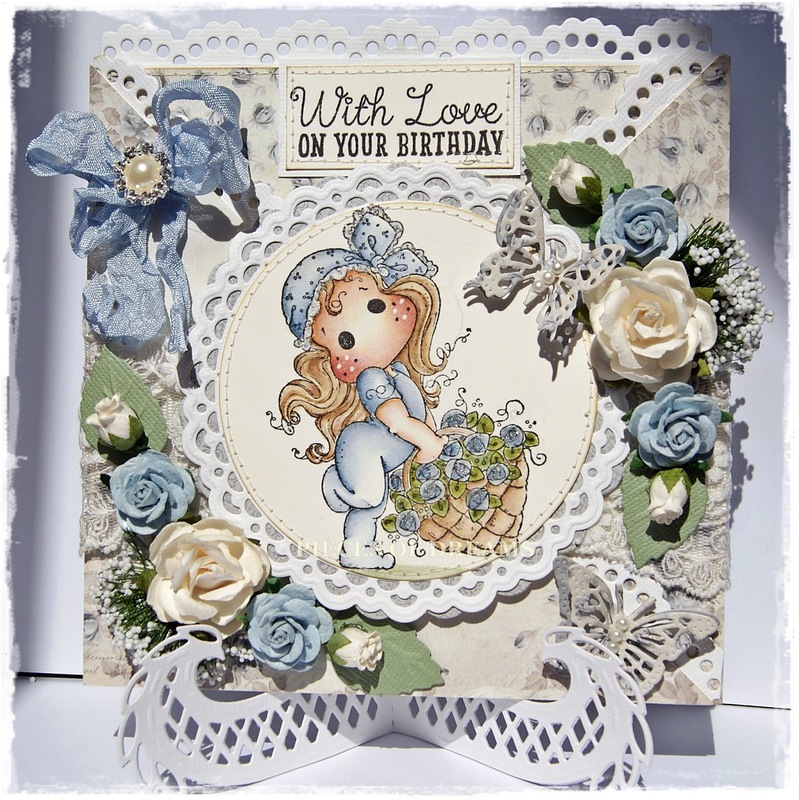 I just love blue cards so I all I had to do was add some pale cream and blue roses and cut a few butterflies. I made a double seam binding bow adding a pearl and diamanté button. 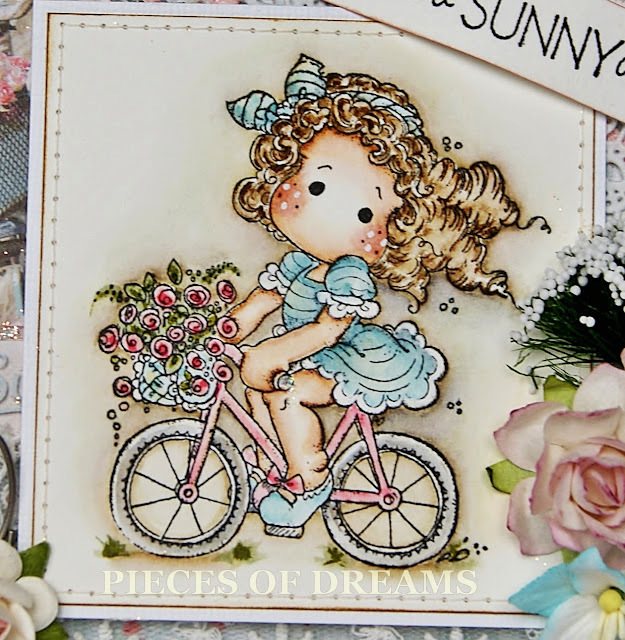 This is the inside card, complete with another favourite of mine, Tilda with Lace Shoes. I have stitched the paper and the Joy Craft die and added a sentiment and a butterfly. Wrapped around the card is my favourite lace! 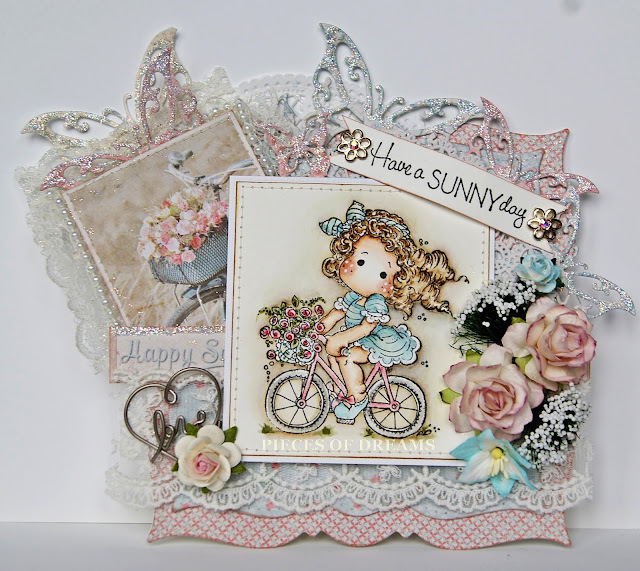 I added a Joy Craft easel stand and the card was complete. 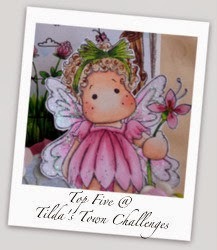 My Happy Everything Tilda Card! Have a lovely week ahead everyone, whatever you plan to do. 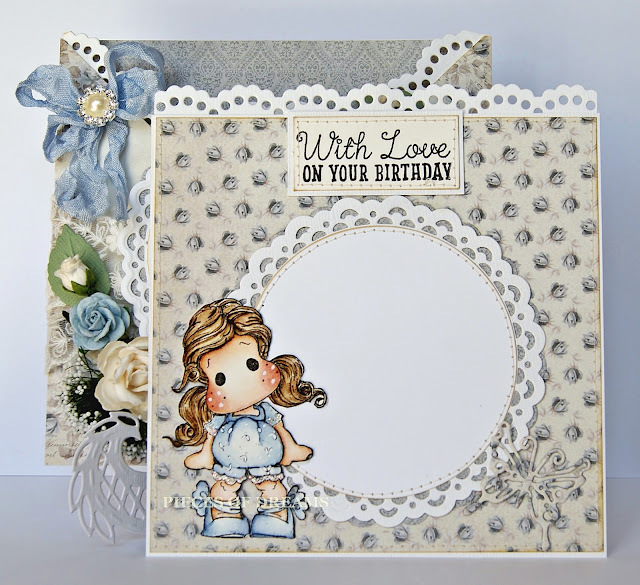 Live and Love Crafts - Blue! Craft Heaven Challenge - Bingo!